Cameroon's first game since the World Cup marks the start of a new era for the Indomitable Lions. Africa's champions are going through a difficult patch, with no competitive matches to play for two years, and the retreat of key players like Lauren and Raymond Kalla. But Cameroon's coach, Germany's Winfried Schafer, believes the friendly against Ivory Coast can be the start of a new period of dominance for his team. "We have a lot of good young players," Schafer told BBC Sport. "It is good for Cameroon, and it is good for me, and I will make a new team composed of new and old players." Schafer has called several new faces into his squad, and seemed particularly excited by Mouhammadou Idrissou. "He has scored eight goals this season in Germany. Fantastic!" he said. Many of the new players will get a run out against the Ivorians, as Schafer experiments with the Indomitable Lions of the future. 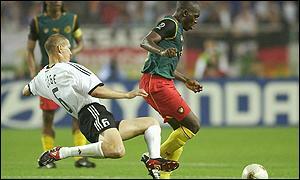 One of the old guard, Marc-Vivien Foe, is convinced Schafer is on the right lines. "I think it is time to bring in some new players, as we have had the same squad for a long time," he said. The Manchester City star is aware they will face tough opposition, but insists the Cameroonians are paying little attention to the Ivorians. "We don't care about the Ivory Coast, we care about our team, and it's important for us to play a good game and, if possible, enjoy ourselves, " he said. "We are going to do our best to best to make the Cameroonian people enjoy." The Ivorians, for their part, have similar preoccupations. Their country has been rocked by a civil war, and the Elephants¿ French coach Robert Nouzaret believes tonight's friendly is a great opportunity to boost morale. "This game is very important for our players: it is a chance to make their countrymen proud of them, even in these difficult times." Goalkeepers: Alioum Boukar, Idriss Kameni, Pierre Ebede Owono. Defenders: Rigobert Song (Cap), Pierre Njanka, Jean-Joel Ndoumbe, Lucien Mettomo, Bill Tchato, Pierre Wome, Timothee Atouba. Midfielders: Salomon Olembe, Eric Djemba-Djemba, Marc-Vivien Foe, Achille Emana, Geremi Njitap. Forwards: Joseph Desire Job, Samuel Eto'o Fils, Cyrille Florent, Idrissou. Goalkeepers: Jean-Jaque Tizie, Guyan Kante, Gerard Gnanahouan. Defenders: Kolo Toure, Cyril Domoraud (Cap), Blaise Kouassi, Mamadou Coulibaly, Giles Domoraud, Lezou Dogba, Saliou Lasissi. Midfielders: Bonaventure Kalou, Didier Zokora, Serge Die, Kanga Akale, Tchiressou Guel, Lassina Diabate. Forwards: Dindane Aruna, Didier Drogba, Hamed Diallo, Georges Ba.